I'm trying to get back into the week routine. My neck/back is bothering me more than usual this morning, so I'm going to keep this short and sweet. Sabrina had a great 6th birthday and now it's time to thank everyone who spoiled her. I made some simple thank you cards to give to her para aides at school. I couldn't believe it when I picked her up from school last week and she needed help bringing her presents home! 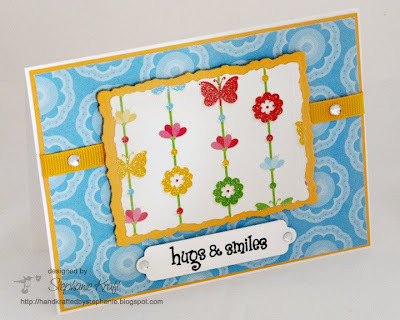 I let the floral/butterfly patterned paper be my main image and kept my card simple, but cheerfuly and a little blingy. I hope you all have a wonderful week and as always, thanks for stopping by! Accessories: Deckled Rectangle Nestabilities and Double Ended Tags (Spellbinders), Cuttlebug (Provo Craft), Rhinestones, Ribbon, Foam tape. Very cute! I'm glad you she had a wonderful birthday. Hope your neck feels better soon.